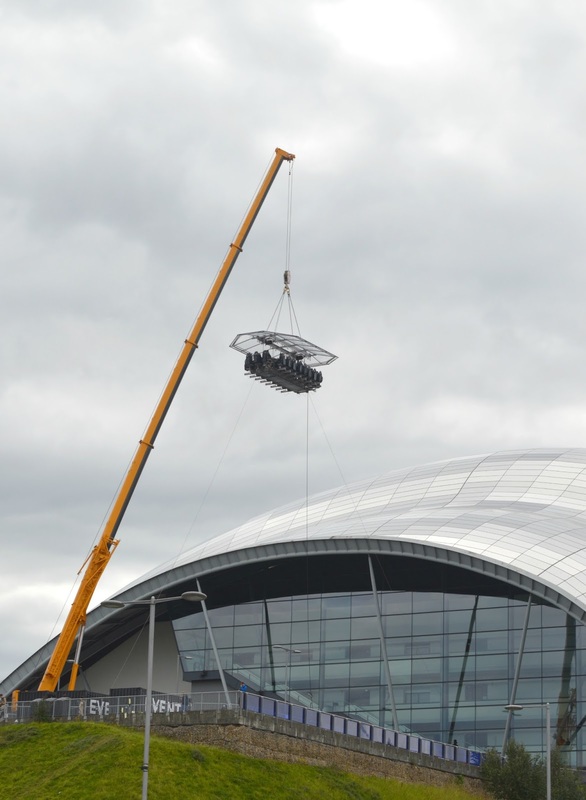 When I first found out that I'd got myself a seat at the press launch for Newcastle in the Sky I was so excited that I couldn't wait to get home and share the news with Simon. 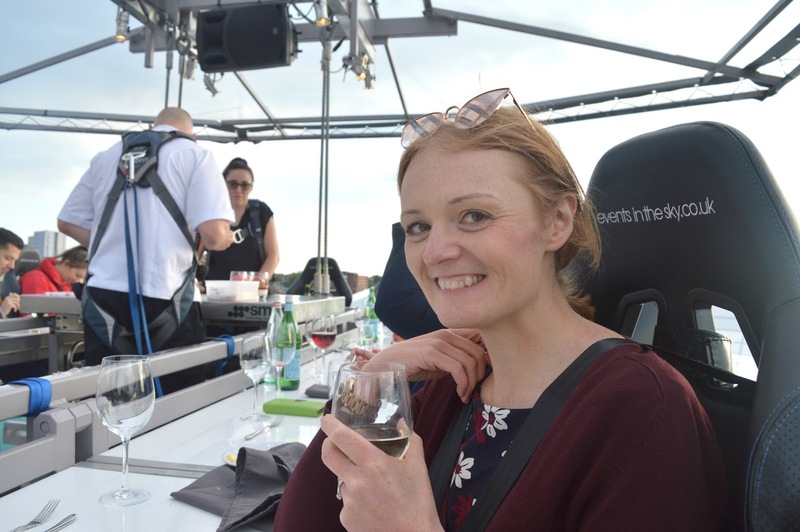 As a lover of food and great views I was thrilled at the thought of being sat at a table hoisted 100 feet in the air over Newcastle whilst eating food prepared by some of our region's finest chefs. Simon's reaction? He had a bit of a chuckle and pointed out that I'd be terrified! 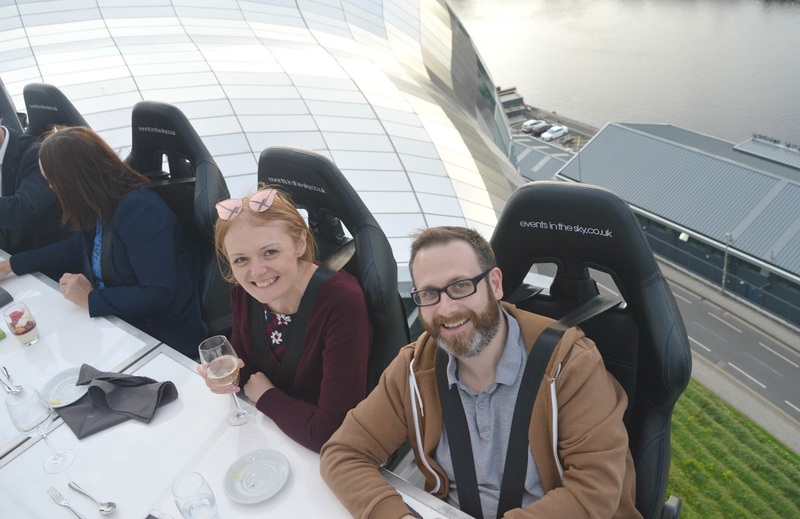 You see, Simon remembers that time his wife screamed to get off a very high rollercoaster, or the time she was almost sick stepping on the viewing platform at Blackpool Tower - how on earth was she going to cope with dining in the sky? Realising he was right, I began to get nervous! Very nervous! Was it really safe? What if the table started swinging in the wind? Would I want to get down as soon as we'd got up? The day arrived and most of the afternoon I had butterflies in my tummy wondering if any of this was a good idea. 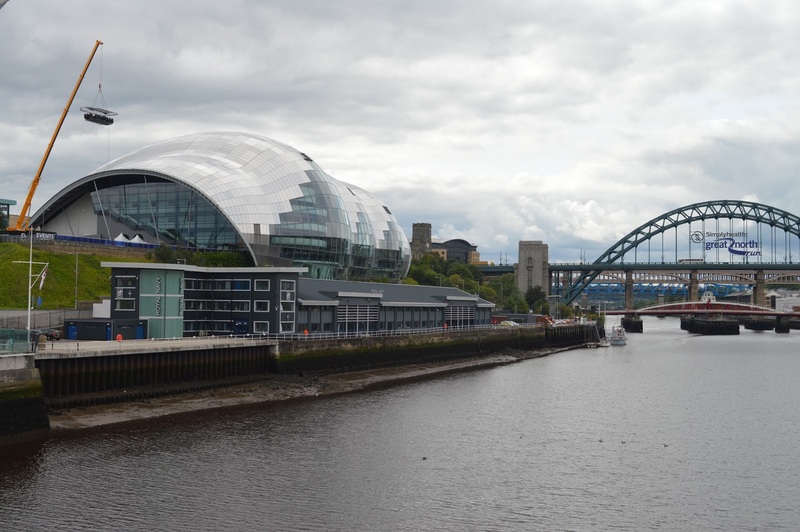 Nerves made me want to cancel but luckily my love for Newcastle and great food won and at 6:00 pm I found myself outside the Sage in Gateshead ready to begin my great adventure into the sky. 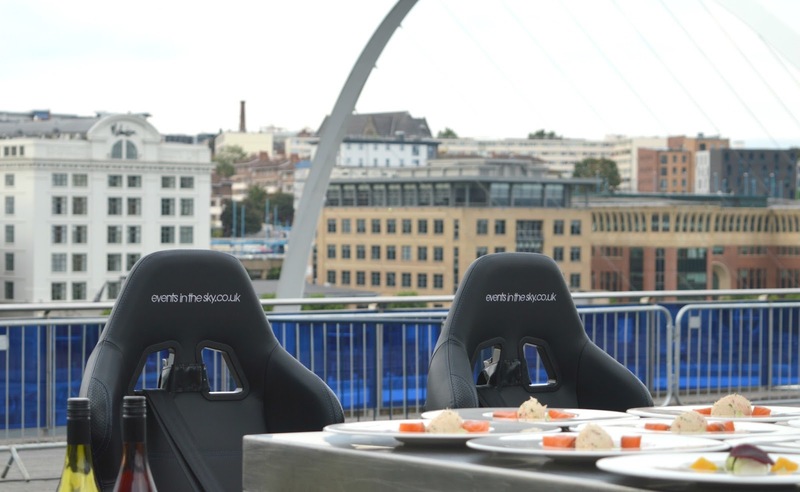 Newcastle in the Sky is a 6 day pop up food event hosted by Events in the Sky that invites some of the city's best restaurants and top chefs to show off their fabulous food to 22 diners sitting at a unique sky table hoisted 100 feet in the air over Newcastle. 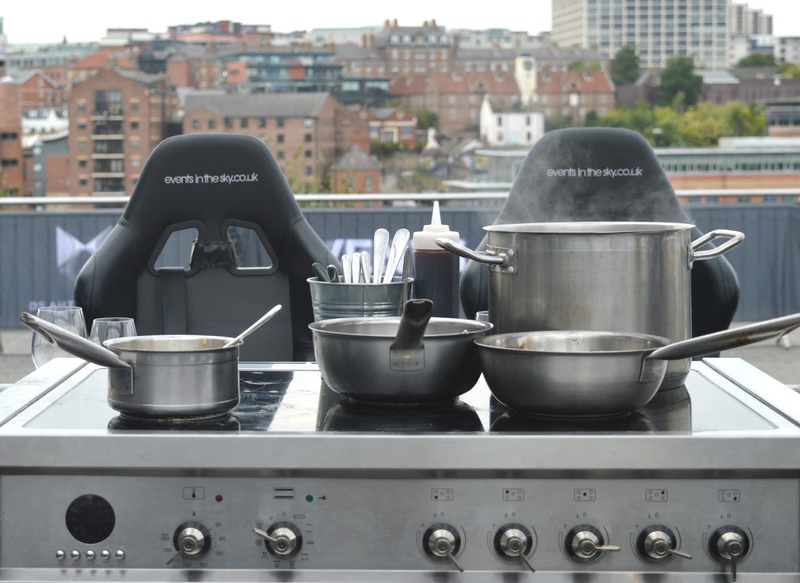 The chefs and waiting team work on their dishes from a tiny kitchen in the centre of the table and food is served with the most amazing views across the River Tyne. Now you can probably understand why I was feeling a little scared! Luckily my nerves began to ease as soon as I arrived and saw the amount of safety equipment and checks involved with Newcastle in the Sky. Learning that we wouldn't be hoisted up if the winds were too high, that staff would check our seat belts before we went up and that we were given a safety briefing instantly put my mind at ease. We checked in and happily accepted a glass of prosecco to steady the nerves as we booked our coats and bags into the cloakroom. There's no room for luggage on the sky table so you can only take the essentials up with you. For me this was my camera and phone, although I was a little nervous about dropping them! After a couple of last minute trips to the (very posh) portaloo it was finally time to take our place at the Sky Table! My legs were a little shaky as we made our way over and I couldn't help but glance up to the top of the crane - was I really about to let myself be suspended off a wire 100 ft over Newcastle? We were taken to our seats in pairs and strapped into our chairs one by one. 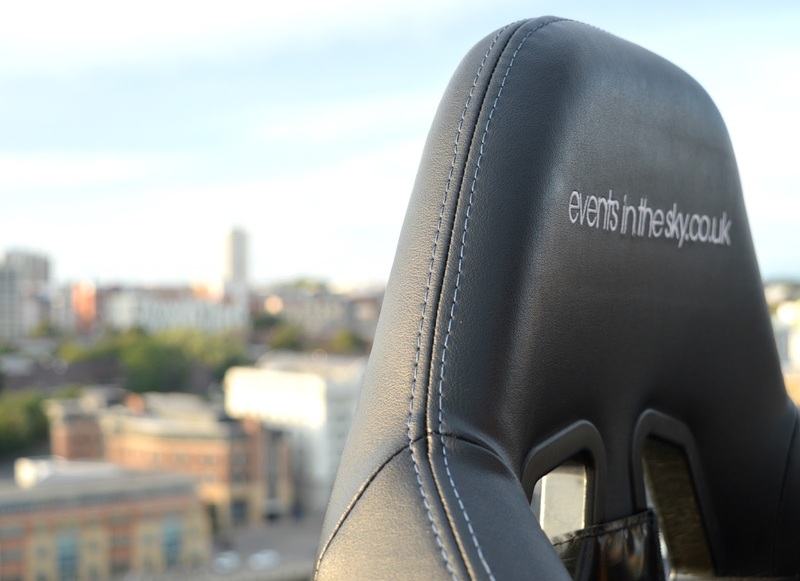 As I climbed into my seat for the evening I was surprised how comfortable it was. The softest leather fully supported my body and as I was strapped in with loads of seat belts and pushed towards the table I felt myself relax. There was no way I was falling out of my seat! Once we were all seated it was time for our flight to begin. We began to rise and any fear that i had immediately vanished. 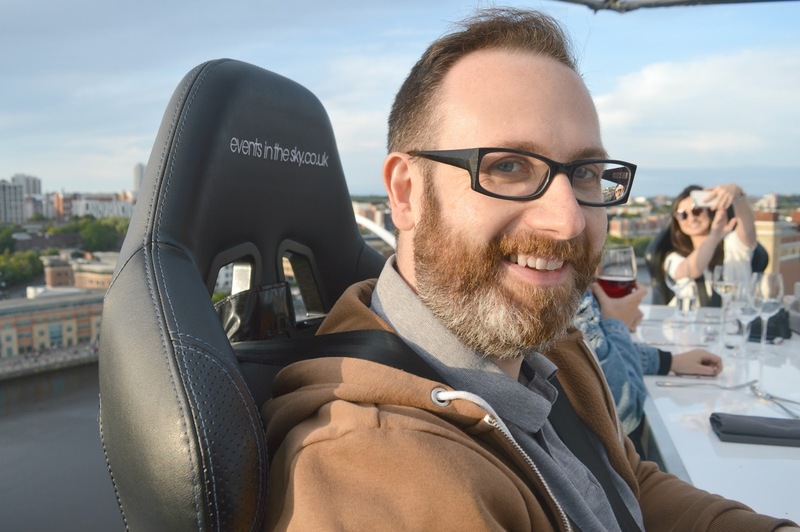 I'd been worried that those first few minutes I'd feel sheer terror but as we rose high above the Sage I was overwhelmed with a great love for my city as I took in the scenery! Within moments we were at the top and we all immediately had our phones out trying to take the perfect selfie. I had been worried that my phone wouldn't feel very safe 100 feet up in the air, but it happily sat on the table next to my dinner plate most of the evening. Once we were all settled (ie I'd slapped on my usual greedy amount of butter onto my bread and had filled my wine glass!) it was time for dinner! Our hosts for the evening were Artisan, located at the Biscuit Factory in Ouesburn, with a great reputation for serving fantastic food, I knew we were in for a real treat! 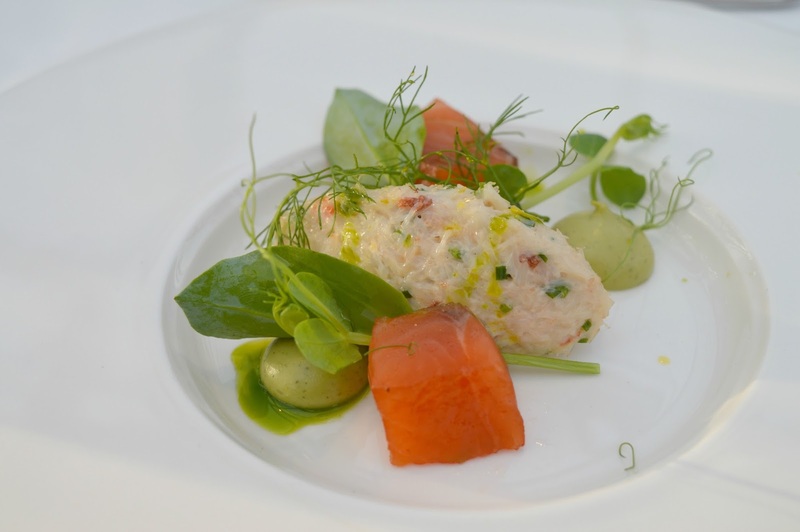 Our first course arrived, North Sea Crab Salad with citrus cured salmon, fennel and orange. Managing to tear myself away from taking photographs I tucked in! This is what I would describe as the perfect dish for Summer - beautifully light with plenty of zing, it went down a treat! First course done, and no cutlery dropped! 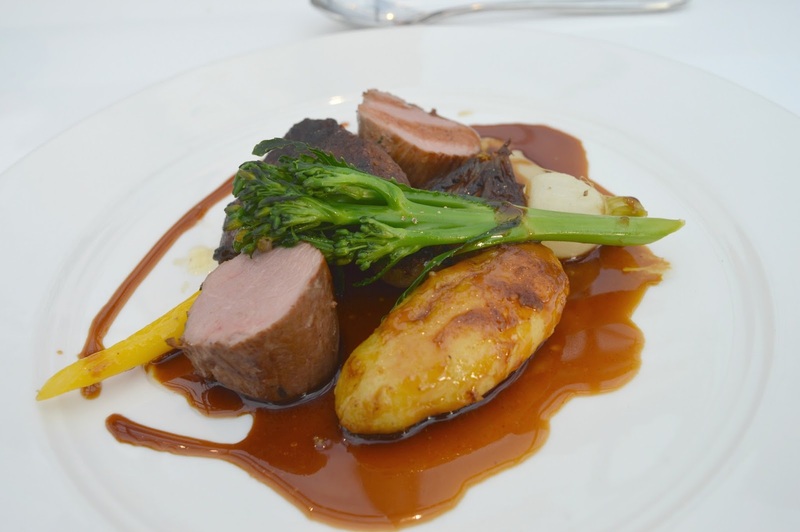 This was swiftly followed by the main event, Northumbrian Lamb with Navarin of Summer vegetables. Lamb is a meat that I'd never order myself in a restaurant as I tend to find it's too tough but this dish was spot on! I especially loved the thick gravy, I would have picked up the plate to lick every last bit off, but I thought that my be a little risky considering where I was. Half way through the meal the table turned giving everyone a chance to enjoy the stunning views from a different angle. By this point I'd had a few glasses of wine and was feeling pretty confident so managed to swing my chair out a little for a better view of the Millennium Bridge. With my feet dangling over the edge I didn't feel even slightly nervous! 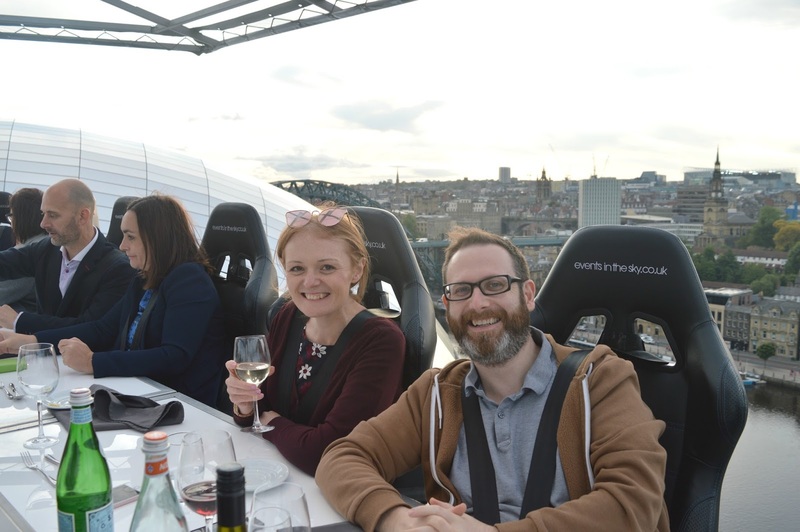 If you have a head for heights make sure you ask if you can get a corner chair when you take up your position at the sky table, those are the seats that twizzle right round giving you the most jaw dropping views across Newcastle! 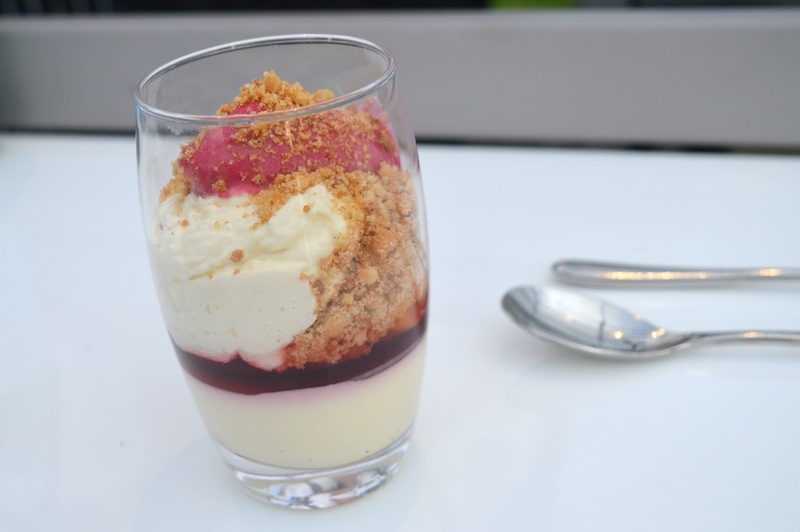 Our meal ended with Vanilla Poached Peach with Champagne, Raspberry and Pistachio which I gobbled up in record speed, it was delicious and I almost took up Chef's offer of eating the extra one he had going spare! 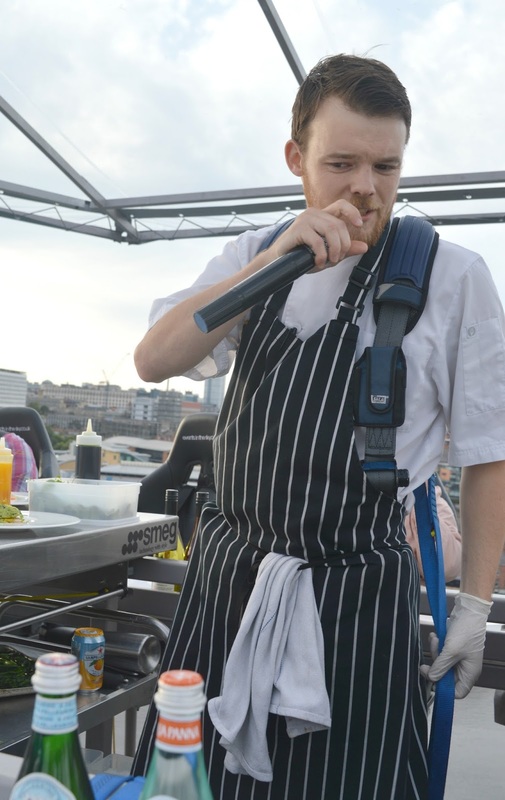 The Artisan chefs did a fantastic job of hosting our table, I can't believe they managed to serve up such delicious food from their kitchen in the clouds! 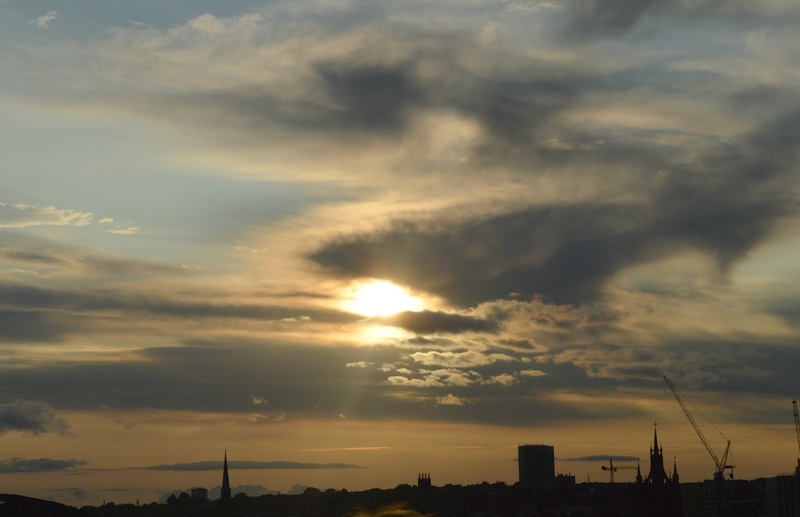 We had been truly blessed with beautiful clear skies and as our trip approached the end Newcastle decided to treat us to a picture perfect sunset. Our whole table glowed in the beautiful orange light and it was so spectacular. Our hour passed in a flash and it was time to come down. I wasn't ready! I had had the most fantastic time and I wanted to go back up! It was the most amazing experience, a definite bucket list moment and something that I'd encourage anyone to do! As we left the table I felt pretty proud of myself for being brave enough to dine in the sky. Along with my helicopter ride and climbing the Syndey Harbour Bridge, it is one of the most special things I've ever done and will stay with me forever. 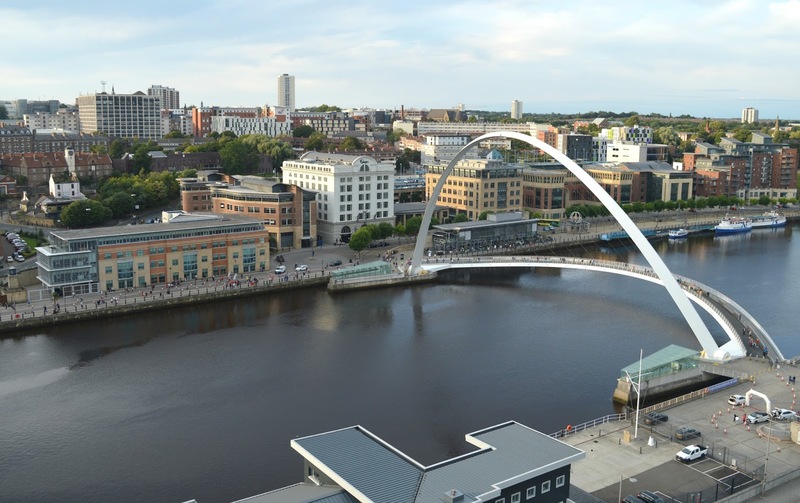 If you love the look of Newcastle in the Sky then make sure you book yourself a seat on one of the Sky Tables, there are plenty of options available including Breakfast, Lunch, High Tea, BBQ, Sunset Dinners and Night Time Cocktails. Some sittings are already sold out so move fast! 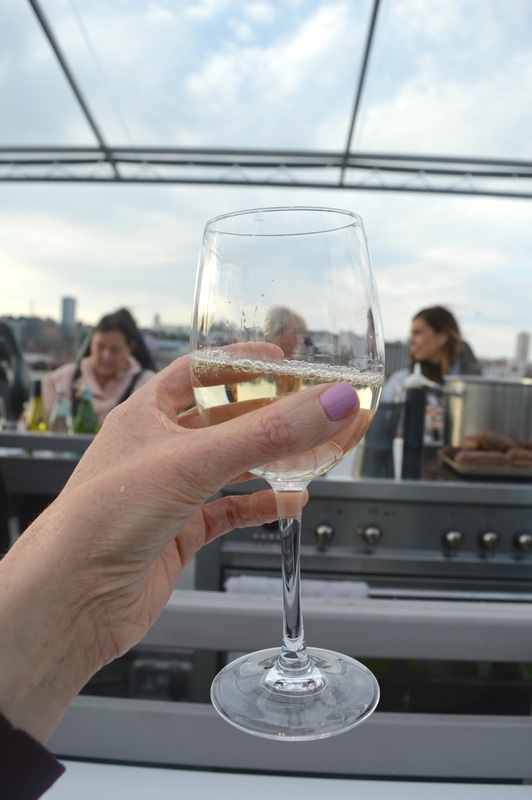 Tickets start from just £52.00 per person with some of my most favourite restaurants in Newcastle taking part including La Yuan, The Gin Bar, Chaophraya and Hawthorns. So what do you think? 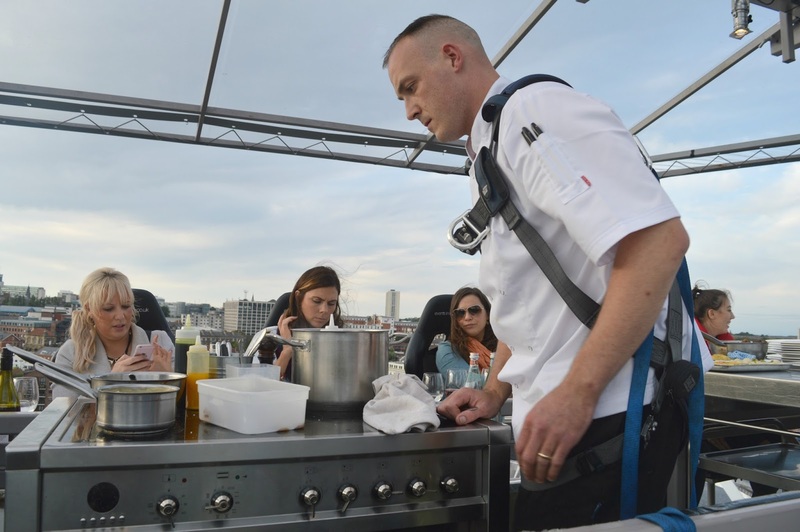 Will you be dining in the sky? 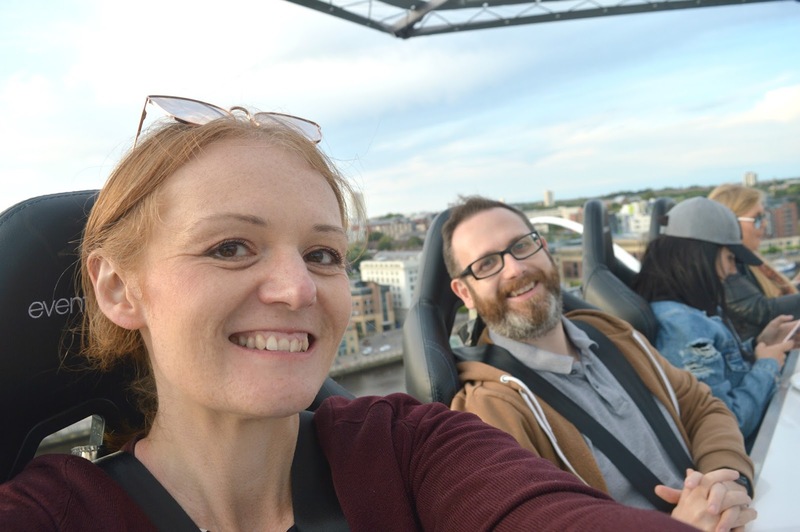 We were guests of Newcastle in the Sky and were treated to a free experience. All thoughts and opinions are our own. Looks like you had luck with the weather. It looks nice and bright while you were up there. There are some fab views from up there. Looks like such a class night and so glad it stayed dry for yous! Woah, this looks insane! What an experience and well done you for conquering your fears! Not sure how I'd quite get on myself, but it's for the love of the blog right?! Nevertheless, glad to see you were properly strapped in and lived to tell the tale!! Yeah what a fab experience and well done for going up there - was this on your bucket list for before you're 40 or an added bonus? I can't remember. The food looks gorgeous too. Wow this looks incredible! I would love to do something like that! The view looks amazing too! This looks insane ohmygoodness, it looks like such an incredible experience. And these photos are wonderful!